This ASCD Study Guide is designed to enhance your understanding and application of the information contained in The Best Schools: How Human Development Research Should Inform Educational Practice, an ASCD book written by Thomas Armstrong and published in November 2006. You can use the study guide before or after you have read the book, or as you finish each chapter. The study questions provided are not meant to cover all aspects of the book, but, rather, to address specific ideas that might warrant further reflection. Most of the questions contained in this study guide are ones you can think about on your own, but you might consider pairing with a colleague or forming a study group with others who have read (or are reading) The Best Schools. The ranking of "the best colleges" by U.S. News & World Report, has recently been a topic of controversy, with some college presidents, including the president of Sarah Lawrence College, arguing that the criteria used to establish these rankings are unfair and do not allow many good features of a school to be highlighted (see Michele Tolela Myers, "The Cost of Bucking College Rankings" The Washington Post, March 11, 2007). What implications can you draw from this controversy that might apply to the use of standardized test scores to rank elementary, middle, and high schools across the country? Research the concept of "discourse" as it relates to the western philosophical tradition in the work of such thinkers as Michel Foucault, Jacques Derrida, and Richard Rorty. What can we learn from such post-modern thinkers that we can apply to our understanding of current educational issues? Discuss factors in the American social, cultural, and intellectual climate over the past century that have contributed to the high level of importance given by parents and educators to standardized test score data in our country. What sorts of feelings, attitudes, and thoughts do you associate with the phrase "academic achievement"? How has the meaning of this phrase changed over the past few decades? Looking over the "Key Events in the History of Academic Achievement Discourse" (Figure 1.1, p. 17), what additional events do you feel have played an important part in the development of Academic Achievement Discourse (AAD) over the past century? Over the past five hundred years? What would you predict might be the course of events in the evolution of AAD over the next fifty to a hundred years? American culture has a strong tradition of belief in common sense, individualism, and nonconformity. How, then, can you account for the basic devaluation in educational circles of anecdotal information and assessment of individual progress when compared with norm-referenced standardized test data? Most parents and educators agree that the aims of education should include character development, moral development, creative development, and even spiritual development. Discuss why these goals have been given so little practical importance in the No Child Left Behind law and its administrative infrastructure? The history of Academic Achievement Discourse consists largely of the development and administration of standardized tests and the impersonal political organization of educational goals. On the other hand, the history of Human Development Discourse is largely made up of individual thinkers and their personal theories, schools, and methods. How have the substantial differences in the content of these two histories affected their respective influences on American education? How are their differences, in a sense, actual mirrors of the discourses themselves? Pick one of the thinkers discussed in the History of Human Development Discourse (Figure 2.2, p. 49), and research his/her life and work. Share this information with your colleagues. What impact does this thinker currently have on the conversation taking place in American education? What are the reasons for this thinker's impact (or lack of impact) on education today? Discuss the current trend toward a greater academic focus in early childhood education programs. Do you feel this trend will continue? What evidence do you see of a backlash to this trend? What sorts of values, ideas, and attitudes do you have toward the word "play" as it applies to young children? What contemporary cultural forces may be working toward a devaluation of this word in the field of education? What current cultural influences may be working toward supporting the idea of play? Select a child age 3–6 to study. Over a period of time, observe the child in free play situations. What sorts of behaviors, language, and products (e.g. block castles, art work etc.) do you see that contribute toward an understanding of early childhood as a distinctly unique period of the life span that includes the presence of physiognomic/multi-sensory perception, holistic thinking, synaesthesia, eidetic imagery, artistic expression, and/or other forms of spontaneous creative activity? Compare an early childhood program that values spontaneous play with a program that emphasizes formal academic instruction. What differences do you see in the children as they engage in each program? How do you compare levels of creativity, anxiety, spontaneity, thoughtfulness, sociability, and self-confidence among the children in each program? Discuss the tacit messages, values, and ideas that children receive about "how the world works" when they are taught using "scripted learning" versus "inquiry-based instruction" (i.e. what do the teaching methods themselves tell children about how the world works?). To what extent has the No Child Left Behind law curtailed the teaching of history, art, physical education, social studies, and music in the elementary schools in your district? What impact do you see this having on the students' understanding of how the world works? What impact is it likely to have upon these students' futures? Research one of the positive school models discussed in Chapter 4 (e.g. MicroSociety, Montessori, children's museums, Foxfire, multiple intelligences etc.). To what extent are elements of one or more of these approaches already integrated into your community's existing elementary school programs? Which elements are not present, but would greatly benefit the students in your district? What first steps would be involved in introducing these approaches into one or more of your district's elementary schools? What are the likely obstacles to implementation? What are some strategies for overcoming these obstacles? Observe a child age 7 to10 engaged in activities the child has chosen without coercion from any outside force. What is the child learning in these activities about how the world works? What do you observe about the child's levels of passion, curiosity, creativity, and/or problem-solving? How does this learning compare with the learning that takes place during activities the child has had chosen for him (e.g. class time, schoolwork, homework, etc.)? Investigate the most current research taking place related to the adolescent brain. In particular, take note of the impact that the biological event of puberty has on the growing brain. What implications should we draw from this research about creating learning environments for students age 11 to 14? Do you see a trend in your community toward the disbanding of middle schools and the reestablishment of junior high schools? If so, what impact do you believe this reorganization will have on students' social, intellectual, emotional, and creative development? Create a lesson plan at the middle school level that engages students' emotional, social, and meta-cognitive needs. Compare student responses with a lesson plan that you create (to the same students) that does not recognize these needs. Interview students about their reactions to the two respective lessons. What implications can you draw from this experiment for the creation of middle school curricula? Choose a middle school or junior high school in your area to investigate. Observe which of the following components are present in the school, and which are missing: safe school climate, engaged learning, small learning communities, personal adult relationships, expressive arts activities, health and wellness focus, honoring and respecting student voices, student roles in decision-making. What impact do you see from the presence or absence of one or more of these elements? Choose one of the components that are missing from the school, and begin to introduce it into the program in some way. How prepared did you feel for life at the time you graduated from high school? Discuss this question with colleagues, and compare your individual experiences. What implications can you draw from this for how high schools should be restructured? Traditionally there has been a polarization between academic learning and vocational learning in the United States. Do you feel that this division is inherently unbridgeable? Discuss ways in which academic learning and vocational learning might be seamlessly integrated in a high school curriculum. Many advantaged high school students are under tremendous pressure these days to take advanced courses, achieve high grades, and test well on college entrance examinations. Discuss whether or not it is possible for such a student to develop their whole self under such conditions (e.g. can a high school student who wants to be a physician also investigate her love for auto mechanics?). What are some solutions for ameliorating the pressure on these students, while still leaving their college goals, and their ability to develop in non-academic areas intact? What would be the implications of taking an existing traditional high school in your area and converting it into a series of "life-bridging" programs (e.g. programs that prepare students for the real world, including apprenticeships, internships, career academies, mentoring, job shadowing, cooperative education, entrepreneurships, etc.). How could such a restructuring be administratively, financially, and educationally accomplished? What would be the likely reaction from the community? What are some first steps to accomplishing this kind of transition? What are the likely benefits to the community? To the students? To the faculty? One of the key motivations for enacting the No Child Left Behind Act was that it was believed that such legislation would help "bridge the achievement gap" between Asian/Caucasian, and African-American/Hispanic students. Investigate what has happened to this "gap" during the time that NCLB has been implemented. Discuss the extent to which raising standardized test scores among minority groups can or cannot help ameliorate centuries of racial, ethnic, and economic inequities in the United States. What is the likelihood that Human Development Discourse will reach a parity with Academic Achievement Discourse in the "marketplace of ideas" in American education? What factors are likely to facilitate or retard an increase in the use of Human Development Discourse among educators? What are some practical strategies for interjecting Human Development Discourse into daily educational practice? We know that the more years of education individuals receive, the higher their lifetime income will be, and the healthier they will be during the course of their lifespan. What implications do these findings have for the use of Academic Achievement Discourse and Human Development Discourse by educators? Do these findings favor one discourse over the other? Or do these findings imply the need for an integration of discourses? What would such an integration of discourses look (and sound) like? Is such an integration even possible, given the overwhelming use of Academic Achievement Discourse in the current educational climate? 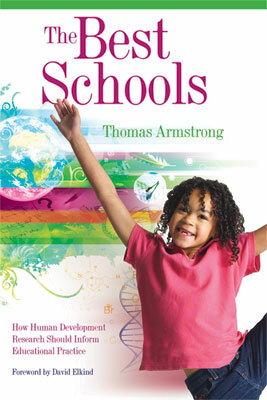 The Best Schools: How Human Development Research Should Inform Educational Practice was written by Thomas Armstrong. This 182-page, 6" x 9" book (Stock #106044; ISBN-13: 978-1-4166-0457-0) is available from ASCD for $18.95 (ASCD member) or $23.95 (nonmember). Copyright © 2006 by Thomas Armstrong. To order a copy, call ASCD at 1-800-933-2723 (in Virginia 1-703-578-9600) and press 2 for the Service Center. Or buy the book from ASCD's Online Store. Copyright © 2006 by Thomas Armstrong. All rights reserved. No part of this publication—including the drawings, graphs, illustrations, or chapters, except for brief quotations in critical reviews or articles—may be reproduced or transmitted in any form or by any means, electronic or mechanical, including photocopy, recording, or any information storage and retrieval system, without permission from ASCD.